Salvatore SCIARRINO: Efebo con radio (1981)1; Il giornale della necropoli (1999-2000)2; Autoritratto nella notte (1982)3; Storie di altre storie (2004)4. Sonia Turchetta1 (voice), Teodoro Anzellotti2,4 (accordion), WDR Sinfonieorchester Köln, Kazushi Ono1,3,4, Lucas Vis2 (conds.). Winter and Winter 910 114-2 (1 CD) (http://www.winterandwinter.com/). In a mood to recycle, Sciarrino generally prefers to rummage through his own material. However, this disc presents a few pieces which adapt and twist others. Efebo simulates a kid twirling a radio dial, suggesting that in his youth the composer did the same. Apparently this boy enjoyed dawdling between stations as Sciarrino imitates poor reception and static. Turchetta ranges from advertising snippets to sung excerpts. The sub-second effect of quickly passing across a music broadcast is performed expertly. Domenico Scarlatti, Mozart and Machaut appear in Storie di altre storie for accordion and orchestra. The three movements incorporate several Scarlatti sonatas (K. 474, 105 and 262), Mozart’s Adagio for glass harmonica, K. 356, and a Machaut tune, Rose, Liz. The first movement is disproportionately longer and links one Scarlatti sonata, the Mozart and the Machaut. The accordion leads us through the orchestrated and mutating territory with ghostly noises bridging the treatments. Sciarrino’s note prepares us for moments that anticipate Stravinsky: They nonetheless startle. The last two movements center around one Sonata each. K. 105 and K. 262 emphasize the Spanish flavor, and I hear references to Respighi, even Berio’s treatment of Boccherini. I imagine we’re treated to a realization of how one composer can’t hear another’s work without thinking of tampering with it. Il giornale and Autoritratto contain more familiar hushed and feathery tones. With solo accordion, Il giornale elicits piercing shrieks over string and wind harmonics. There are brief tuttis when orchestra and accordion deliver a phrase, suggesting a tango heard through a closing door. For Il giornale Sciarrino’s note is lengthy and unhelpful. I imagine holding a mirror on a dark night and seeing in the reflection the City of the Dead. If you were expecting a traditional concerto, this may disappoint: Accordion and orchestra are self-effacing. Autoritratto, at 7:18 compared to Il giornale’s 20:26, contains more notes and less often retreats into silence. The booklet offers a picture of Sciarrino looking at music, which to my eye, looks to be Ferneyhough’s. “BarockModern.” Matthias Georg MONN: Concerto in D major for harpsichord and orchestra (1746; arr. Arnold SCHOENBERG as Concerto in D major for harpsichord and orchestra adapted for cello and orchestra, 1932-33)1. Georg Friedrich HANDEL: Concerto Grosso, Op. 6, No. 7 (1739; arr. SCHOENBERG as Concerto for string quartet and orchestra in B-flat major, a free interpretation of the Concerto Grosso Op. 6, No. 7, by George Frideric Handel, 1933)2. Arnold SCHOENBERG: Theme and Variations, Op. 43b (1943)3. Johannes Moser1 (vlc), Quatuor Diotima2: Eiichi Chijiiwa, Wi Nicala Miribel (vln), Franck Chevalier (vla), Pierre Morlet (vlc), MDR Sinfonieorchester1,2,3, Jun Märkl1,2,3 (cond.). MDR Klassik MDR 1205 (1 CD) (http://www.mdr.de/mdr-klassik/). Even when Schoenberg tried not to be atonal he could still be ornery. Brooding pieces that fail to align with the image of Schoenberg as innovator, these late, quasi-tonal works may always remain alien. He intended the cello concerto for Pablo Casals! In his Monn reworking, Schoenberg primes us for ghostly apparitions and unexpected dissonances. Instead we get sparkling glockenspiel, piccolo and xylophone among other peculiar Baroque effects. In the Handel concerto, an essay in balance, the quartet continually skirts inaudibility and irrelevance as the foursome engage in decidedly non-Handelian shenanigans. Here too we anticipate darkness (he completed the work in Paris after he fled Berlin), but no, the mood is ambivalent. Op. 43 comes in two flavors: for band (Op. 43a) or for orchestra (Op. 43b). Don’t confuse it with the better known Variations for Orchestra, Op. 31. Op. 43 is neither 12-tone nor toothsomely tonal. Intended for high-school band ensembles, Schoenberg recast it for orchestra. The variations loiter like hung-over Strauss or Hindemith. Perhaps that’s it: Schoenberg’s quasi-tonal pieces are the productions of an impaired serialist. The project is well executed and part of a larger Märkl / MDR series. The booklet offers plenty of photos and detailed notes. We’re reminded that Schoenberg poured his first 12-tone essays (e.g. : the Suite, Op. 23) into Baroque forms. 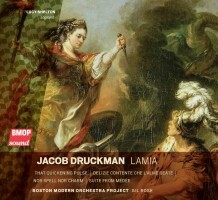 Jacob DRUCKMAN: That Quickening Pulse (1988); Nor Spell Nor Charm (1990); Lamia (1974-75, rev. 1986)*. Francesco CAVALLI: Delizie contente che l’alme beate (1649; arr. DRUCKMAN, 1985). Marc-Antoine CHARPENTIER: Suite from Médée (1693; arr. DRUCKMAN, 1985). Lucy Shelton* (sop), Boston Modern Orchestra Project, Gil Rose (cond.). 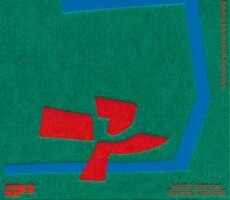 BMOP/sound 1029 (1 CD) (http://www.bmopsound.org/). In this program’s balance of modern alongside old, we learn that Druckman knows how to manage foreground and background. Druckman was also alert to his place in history. It instills his music with confidence. In the notes, La Folia contributor Dan Albertson identifies similarities to Lutosławski’s orchestration and language. Dutilleux, another master of transparency across multiple layers, came to mind. That Quickening Pulse provides a feisty concert opener with dissonant fanfares. Nor Spell Nor Charm, intended for mezzo-soprano Jan DeGaetani, became a memorial after her death. Its animated line often exposes supporting synthesizer notes. The wonderful Lamia’s four movements commingle love poems and sorcerers’ incantations including texts used by Cavalli and Wagner. Shelton is excellent in Lamia. The two arrangements drape 17th-century music in late-20th-century vestments. They are tasteful even though BMOP plays them as any modern orchestra might: As if strong downbeats and emphatic articulation were the keys for unlocking the Baroque’s secrets. For Cavalli’s aria, Delizie contente che l’alme beate from Giasone, Druckman hands the solo castrato line to an English horn. No jokes, please. The Charpentier exudes majesty with forward strings; the Rondeau provides a rousing trumpet line. But don’t mistake this for a period effort. It is a challenge to figure out the original dances when accented beats are distributed other than uniformly. Recalling the function of “early music” in the mid-1980s, I suspect these arrangements were a reaction to the prevalence of stodgy Handel. 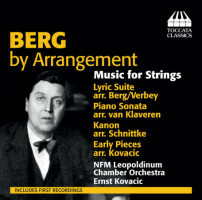 “Berg by Arrangement – Music for Strings.” Alban BERG: Piano Sonata, Op. 1 (1908; arr. Wijnand van KLAVEREN, 2011); Early Pieces (1904-07); Kanon (1930; arr. Alfred SCHNITTKE, 1987); Lyric Suite (1925-26; arr. BERG, 1927; arr. Theo VERBEY, 2005). NFM Leopoldinum Chamber Orchestra, Ernst Kovacic (cond.). Toccata Classics TOCC 0247 (1 CD) (http://www.toccataclassics.com/). This series addresses the occasionally strange results when one composer transforms another’s work with often odd instrumental adjustments. Except for the string orchestra treatment of the Sonata, Op. 1, which is actually fairly clear-cut, these Berg arrangements don’t completely qualify. The remaining pieces were originally for strings. The Lyric Suite’s large-ensemble instantiation was never a stretch. Except for Berg’s own elaboration of the Lyric Suite, these claim to be first recordings including the commemorative four-part canon, whose voices were unspecified (Ensemble Resonanz put out an ensemble Lyric Suite earlier this year on Harmonia Mundi 902150). The 1930 canon’s premiere took place at the Frankfurt opera house. How it was performed is not clear. Except for the nine voices, Schnittke’s string orchestra with ad lib solo violin is reasonably straightforward. Would we be as captivated with the Lyric Suite if the hidden program had never come to light? Embedded among the lushness, the Tristan quotes stand out, and the palindrome does fascinate. Perhaps because Berg’s own arrangement of three movements (II, III and IV) is more familiar than the original six-movement quartet, it’s strange to encounter I for large ensemble. I tried to set aside my prior verdict on Verbey’s orchestral arrangement of Op. 1 (http://www.lafolia.com/mostly-symphonies-20/), but there’s really not much that can go wrong here. 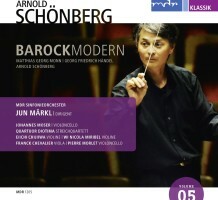 Berg’s output is so small that any extra views, even of the Early Pieces, juvenilia from the time he studied with Schoenberg, are to be desired.